Review by AllTheBestFights.com: 2016-10-01, great performance by both boxers: Juergen Braehmer vs Nathan Cleverly gets three stars. The Wba and former Wbo light-Hw champion Juergen Braehmer entered this fight with a professional record of 48-2-0 (35 knockouts) and he is ranked as the No.6 light heavyweight in the world (currently the #1 in this division is Sergey Kovalev). He suffered his last defeat in 2008, against Hugo Hernan Garay, since then he has won 17 consecutive bouts beating Konni Konrad (=Braehmer vs Konrad) and Eduard Gutknecht in his last two (=Braehmer vs Gutknecht 2). His opponent, the former Wbo light-Hw champion Nathan Cleverly, has a mma record of 29-3-0 (15 knockouts) and he entered as the No.10 in the same weight class but he lost two out of his last three bouts, against Tony Bellew in 2014 (=Cleverly vs Bellew 2) and Andrzej Fonfara in 2015 (4-stars fight, Fonfara vs Cleverly). Between these two bouts he beat Tomas Man (=Cleverly vs Man). 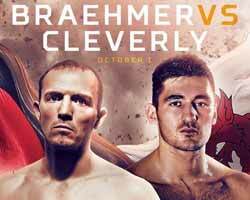 Braehmer vs Cleverly is valid for the WBA World light heavyweight title. Watch the video and rate this fight!